Should You Hire a Foreclosure Attorney? It can depend on state law and whether you can afford your home. If homeownership is the American dream, then facing foreclosure is the ultimate nightmare. But it’s not always a foregone conclusion that you’re going to lose your home if you fall behind with your mortgage payments. Options are available and help is out there if you know where to look. Not all foreclosures are created equally, and you have a better chance of fighting some than others—with or without an attorney. Non-judicial foreclosures can move very quickly because they don’t have to involve the court system. The procedure isn’t exactly the same in all the states that allow for these foreclosures because the rules depend on state law, but in many cases, your lender need only file a notice of default or similar document with the county recorder’s office. It will then publish a date on which it intends to sell your home, typically at auction. Unfortunately, the majority of states—29 of them and the District of Columbia—recognize this type of foreclosure as of 2019. You might be subject to it if you have a deed of trust rather than a mortgage, and if the deed of trust includes a “power of sale” clause. A judicial foreclosure must move through more restrictive legal channels. Your lender must first file a lawsuit against you, and you have the right to respond to that lawsuit in court. The lawsuit will effectively ask the judge to allow the lender to take possession of and sell your home, and the lender can’t do so without a judge’s OK.
You can sometimes make the lawsuit go away if you can catch up your late mortgage payments within 30 days. Foreclosure Counseling, a Lawyer, or Both? You’ll want to make a move immediately as soon as you receive a notice of the foreclosure, whether it’s a lawsuit complaint or a copy of the notice of default. Get some help in assessing your situation. HUD-certified housing counselors provide this service free of charge. A state-by-state list of counselors is available on the HUD website. Depending on your personal circumstances, you might find that you really don’t need to go to the expense of hiring a foreclosure attorney after you speak with a HUD counselor. She can guide you through the process of applying for a mortgage modification to help you try to save your home. A modification involves adjusting your interest rate or stretching your payments out over a longer term, both of which will lower the monthly amount and make your payments more manageable. If you do decide that you need an attorney after speaking with HUD, the counselor can help you make sure that all the documents you’ll need are up-to-date and accounted for if you reach out to her first. When Would You Need a Foreclosure Attorney? You might want to consider enlisting the help of a foreclosure attorney if the HUD counselor indicates that the likelihood of you being approved for a loan modification is iffy. An experienced lawyer might be able to swing the odds back in your favor, at least a little. And you’ll probably want to hire a lawyer if you’re dealing with a judicial foreclosure. You have a narrow window of time, usually about 30 days although it depends on state law, to respond after you receive a copy of the lawsuit complaint—you’ve been “served” with it. You must respond in writing and file your answer with the court, presenting your arguments as to why your lender should not be permitted to foreclose. This might be a job for a foreclosure attorney. You’ll probably also have to appear in court on a specified date to make your arguments to the judge in person. You can do all this yourself if you feel qualified, but keep in mind that a single, simple mistake can potentially cost you the lawsuit and your home. Of course, if your lender changes your locks and takes possession of your home and your property before it’s legally entitled to do so—and it’s been known to happen—you’ll want to do everything you can to rectify that. You’re usually permitted to file a lawsuit against the lender in this case, even if you're dealing with a non-judicial foreclosure. You might want a lawyer’s help with this. If the HUD counselor suspects something is wrong with your paperwork—maybe you were approved for a mortgage you really didn’t qualify for or she suspects fraud on the part of the lender—you’ll definitely want to at least take it to an attorney for review. What are your odds of success if you try to fight the matter in court? You don’t necessarily have to hire a lawyer to handle the entire foreclosure process. You can simply pay for a consultation to get a little more legal guidance than a HUD counselor is able to give you. Where to Find an Attorney and How Much Will It Cost You? Not all lawyers offer the same fee arrangements for handling foreclosure situations. Some charge hourly, but this doesn’t necessarily mean you’ll be able to just write her a check once a week as the process plays out. You’ll probably be expected to place a retainer with the firm, a certain amount of money that the lawyer’s time is then billed against. For example, you might put down a $4,000 retainer. If the attorney charges $200 an hour, that $4,000 will buy you 20 hours of his time, then, if your foreclosure isn’t resolved by then, you’ll be asked to put down another retainer. Other lawyers might simply charge a $4,000 flat rate. You’ll probably be asked to pay costs on top of these fees, such as filing fees with the court. There’s something to be said for paying a retainer. The laws in most states require that the attorney must give you a written accounting each month of what time she’s billed against that money, so you’ll have a clear understanding of what she’s done for you and what your money has paid for. Not so with a flat fee, but at least that flat fee is generally all you’ll have to pay. You won’t be asked for more money halfway through the process. Attorney fees can range from to as little as $100 an hour to as much as $500 an hour. It can depend on their experience and where you’re located—lawyers in metropolitan areas tend to charge more. Foreclosure representation might be offered for a flat fee of $1,000 up to $4,000 or more, depending on the details and complexity of your situation. How Can You Afford All This If You Can’t Pay Your Mortgage? So where are you supposed to get all this money for representation if you can’t even make your mortgage payments? Most legal aid offices handle foreclosures, and they’ll do so for free or at a reduced rate, depending on your income. Do an online search for legal aid in your county to find out if you qualify. Otherwise, you might want to ask that HUD counselor for attorney referrals. She might know of reputable local attorneys who won’t charge you a fortune. Two critical factors can influence whether you hire a foreclosure attorney to help you save your home. Can you afford it? Do you have a legal defense? Maybe you missed those mortgage payments because of a cash-crunch situation that has resolved or that will be remedied in the not-too-distant future. In this case, a loan modification might just be your answer if you have or will have the income necessary to bounce back. Otherwise, it might not make much sense to spend more money on an attorney or a lot of time and effort with legal aid, fighting the inevitable. You might also want to at least consult with a bankruptcy attorney if you’re turned down for a loan modification. 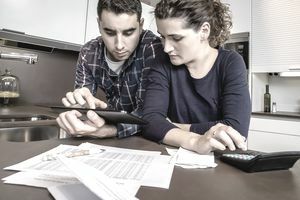 Filing for Chapter 13 bankruptcy would allow you to keep your home and pay off your mortgage arrears over a multi-year period if you qualify. An attorney can advise you as to whether you do. The feasibility of hiring an attorney also depends on whether you have a legal defense to the foreclosure. Can an argument be made that would prevent you from losing your home? Some common defenses include the lender’s inability to produce the original mortgage note—sometimes companies buy mortgages from other companies and paperwork can get lost in the shuffle. You would have a legal out in this case. Or maybe the lender can produce the original note, but something about it is procedurally inaccurate. A foreclosure attorney would know, and a simple consultation can tell you whether you have grounds to fight back. How Can You Afford All This? How to Catch up When You Fall Behind on Your Mortgage Payments. How Much are Will it Cost to Get a Document Notarized? Does it Make Sense to Buy Mortgage Life Insurance? Why Are You Paying Appraisal Fees to Buy or Sell?